One jar of Vegemite and one jar of Vegemite Cheesybite, both products of Australia and both lugged to NEAROF! HQ in Calgary, Alberta, Canada via suitcase. 2:17 p.m.: Hi, everyone. Welcome to the first ever NEAROF! live blog! 2:19 p.m.: Yesterday was the four-year anniversary of NEAROF!’s launch, so I thought we’d try something different to mark the occasion. That’s what this live blog thing is. 2:23 p.m.: Other people cover elections and major world events in this format. I’m going to use it to sample Vegemite live, for your reading pleasure. 2:25 p.m.: Feel free to direct any questions to me in the comments section below, and I’ll try to address them as I go along. 2:27 p.m.: I’ve timed this to coincide with Monday morning hours in Australia (when I reckon people will be sitting down to a Vegemite-filled breakfast), even though it’s Sunday afternoon in Canada. I think. Time zones are hard. 2:28 p.m.: I’m just using WordPress, not some fancy live-blogging tool, so you’re going to have to hit refresh to see new text as I write it. Sorry about that. 2:30 p.m.: I’ve never tried Vegemite before. I think I first learned of it while backpacking in the UK after I finished my university degree. I distinctly remember an Australian guy at a hostel on the Isle of Skye digging around in a jar of the stuff. It looked nasty. He applied this brownish, sludgy sort of spread to a slice of bread, and I made a mental note of the bottle and label. 2:33 p.m.: I’ve never touched the stuff, partially because I never particularly wanted to buy a jar to sample a bite, then risk discarding the rest due to lack of interest. The other reason? I honestly had no idea where to find it locally. 2:35 p.m.: You can find Marmite if you check the various UK import shops around town. I could probably find some in Banff if I looked hard enough, since there’s no shortage of Australians there, and where there are Australians, Vegemite is never far away. 2:37 p.m.: While both of these jars of Vegemite and Vegemite Cheesybite made their way to me as a gift from Australia, I did a bit of research before I sat down here today. I found a jar of classic Vegemite at the Brentwood London Drugs in Calgary for $6.99. So there you go, Calgarians of Australian origin. Now you know. 2:40 p.m.: And speaking of Australia (and there’ll be a lot of that happening today, I think), I’m going double-Australian with this. I’m testing it on a slice of bread from Cobs, the Canadian wing of Bakers Delight, which is a staple of Australian bread culture. 2:42 p.m.: But wait! 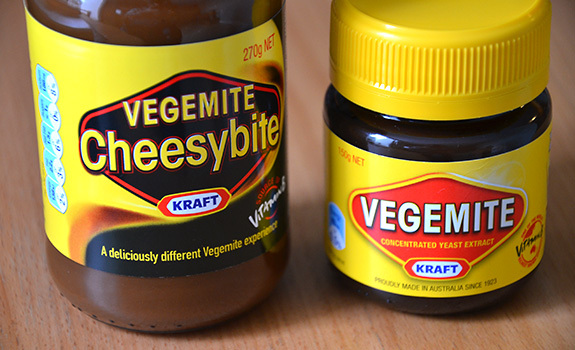 I guess this is actually a triple-Australian review, since I’ll be tasting both classic Vegemite and Vegemite Cheesybite, a sort of Vegemite meets Cheez Whiz hybrid. I understand that it’s a bit controversial in Australia. Let’s just say countries around the world all have their own issues with global brands taking over other brands. 2:44 p.m.: Time for a shout-out. All the Vegemite in this experiment comes courtesy of my lovely Australian aunt. Thanks! 2:45 p.m.: So, let us begin. 2:48 p.m.: Now, I like yeast just fine. It’s what turns hops and sugary malt water into beer, and flour, salt and water into bread. But I wouldn’t just eat a tablespoon of yeast from the jar. That sounds like a recipe for disaster. How is Vegemite any different? 2:50 p.m.: That’s my initial skepticism coming through. I’m certainly not alone in this thinking, at least in this part of the world. I’m not sure if questioning Vegemite’s amazingness is to Australia what questioning the power of poutine is to Canada. 2:52 p.m.: So if I try it and don’t like it, please, Australian government, don’t deny me a visitor’s visa out of spite should I decide to apply for one. 2:58 p.m.: That’s right, Australia. The world will never stop associating you with Men at Work, in the same way Canada will always have to deal with the global culture consequences of having unleashed Celine Dion and Avril Lavigne on the world. Best to just accept it. 3:00 p.m.: I guess it’s time to crack open the first jar. I’ll start with the regular Vegemite, since that’s the gold standard. 3:07 p.m.: It looks like a glossy chocolate spread, with a small little marking on the surface from when it was poured into the jar at the factory. Purely on visual, it doesn’t look too bad. Let me try to take a photo. Hang on. This is going to involve a camera, Bridge, Photoshop, etc. On a six-year-old MacBook Pro. Yep. We’re pretty cutting edge here at NEAROF! central command. If updates vanish for 10 minutes, know that I’m still here. 3:13 p.m.: No, Apple Software Update. I don’t want to install a new version of something right now. Sigh. 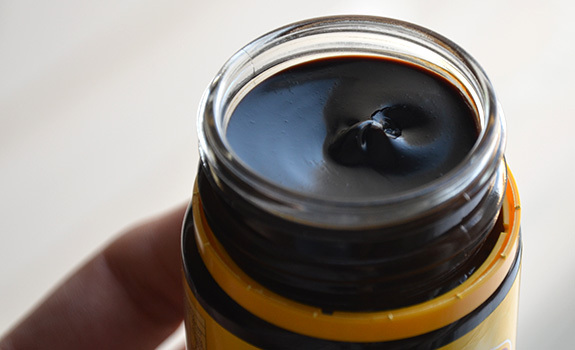 I’ve opened the top of the Vegemite jar, and this is what it looks like. Deep, chocolate brown in colour, with a glossy surface. But it’s pretty solid. Doesn’t move around at all. Keeps its shape. 3:18 p.m.: BRB. Off to get my power adapter. Battery life on this beauty ain’t what it used to be. 3:25 p.m.: The smell is … hmmmm. Like a multivitamin that doesn’t care what it smells or tastes like? Yeasty, yes. But a sort of vegetal, molasses-tinged yeasty. 3:27 p.m.: It doesn’t smell awful or inedible. But it’s not something I’d think to spread on a slice of bread. 3:28 p.m.: And so, why don’t we spread it on a slice of bread? 3:36 p.m.: Now that it’s been spread, the smell has become stronger. Much stronger. I was told that the key to spreading Vegemite is to go light, and to not spread it like peanut butter on the surface of a piece of bread. It’s apparently fairly intense, so less is certainly more. 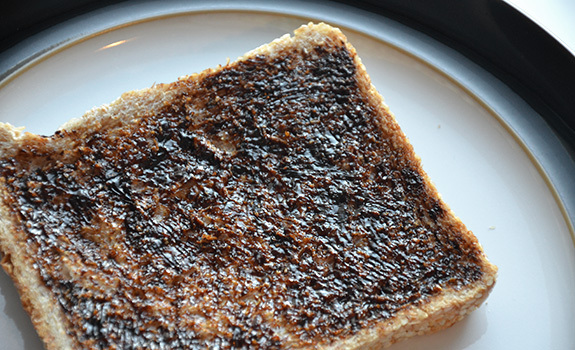 Vegemite spread on a slice of Cobs bread. I tried to spread it as thinly as I could, without ripping up the bread. 3:46 p.m.: Awwwwwww, hellllll. Yuck, yuck, yuck. Salty as a sailor, with a sharp taste that’s hard to place. Medicinal, yeasty, bad molasses. That’s it. Two bites total, and I’m done. Not my cuppa. At all. 3:48 p.m.: Need a palate cleanser, pronto. Why is this so popular in Australia? I don’t get it. 3:54 p.m.: How about you, Cheesybite? I’m going to spread it even thinner on the bread. After the regular Vegemite, I’m going to play it super safe on this one. 3:56 p.m.: The Cheesybite? Not entirely terrible, actually. The cheesy taste fights back against the Vegemite harshness and intensity. 3:58 p.m.: It’s also a whole lot easier to spread thin, which helps to moderate things a bit. Not as much per square inch. It still has the yeasty medicinal taste, but it’s less pronounced. I could see using this on a baguette sandwich with salami, mustard and cheese. 4:01 p.m.: I have been joined by a curious toddler. 4:07 p.m.: The Cheesybite is more accessible, by a long shot. With the Cheesybite, you can at least taste the bread. It’s savoury and salty, and I could see using it with other things without it drowning out all the other flavours. 4:10 p.m.: So, to recap: Regular Vegemite is, to my tastes, pretty awful. Maybe if you start eating it when you’re young, it becomes an acquired taste. 4:12 p.m.: Vegemite Cheesybite is acceptable. It’s not as aggressively difficult to like, and folks who aren’t used to it (people like me) could conceivably appreciate it if given enough time and repeated exposure. 4:13 p.m.: But don’t get me wrong. I’m not going to actively seek it out again. At least I can cross off “try Vegemite” from my list of foodie things to experience. 4:15 p.m.: Also, I have taught a toddler how to say Vegemite. You’re welcome, Australia. 4:19 p.m.: I wasn’t expecting that. 4:20 p.m.: I guess we know who’s going to finish off our stock of Vegemite. 4:21 p.m.: And that just about wraps things up. Thanks for following along! 4:24 p.m.: We’ve got lots of good things coming up during the next couple of months. Remember to come back, eh? I haven’t tried veggemite but I’m a fan of marmite. I went to visit relatives in England when I was in my mid-20’s and I’ve been hooked ever since. My Brit relatives put it on MUCH lighter than you did. They toast their bread, butter it up so the butter melts in, then draw a marmite criss cross pattern over the buttery toast with the edge of their knife. It is really yummy with a slightly salty savoury taste. I’m not sure if Australian’s eat their veggemite this way but if you happen to end up with some again give it a try. You really put vegemite on very very thick for a novice, so not surprised you didn’t care for it. Personally, I love the stuff and I do put it on very thick, but I have years of marmite experience:). Is this blog dead? Only a few updates last year….